Nov 2019 - Jurassic Lake Hosted - NOW FULL!! We have been in love with Iceland since we first visited in 2009. Countless lakes and rivers with crystal clear water where trout, both sea run and brown trout, Atlantic salmon and Arctic char find the perfect conditions to thrive. Due to private ownership of all water there is a limited number of rods on each river so pressure is kept low and regulations are in favour of the fish and their environment. So not only can you find great fishing in Iceland you can also find the rare chance of privacy, solitude and the sense of getting away from it all. The Straumfjarda River is a very nice salmon river located on the Snaefellsnes peninsula on the West coast of Iceland. It is fished with a maximum of 4 daily rods and usually those 4 rods are all sold together. The river is fed by two mountain lakes as well as several smaller streams. The total length of fishing area is 12 km from sea to the top waterfall Rjúkandi. The river is divided in to 4 different beats with one rod fishing each beat but of course there are no strict beat rotation rules among friends that share the whole river. There are 27 named pools in the river and each of them offers different challenges to the other. LODGING DETAILS: The lodge is perfectly suited for a small group with 5 double bedrooms, each with en suite facilities. The living room is very nice and cozy with a fireplace and the seperate dining room can easily fit groups up to 10 - 12. In a seperate building there is a scandinavian style sauna where anglers can unwind and relax after a long day of fishing. There is a veranda overlooking the river. Perfect for the more private groups that want to have the whole lodge to themselves as well as the whole river. Some 90 mins from Reykjavik on the west coast in breathtaking scenery. Nice new lodge. LENGTH OF STAY: The typical lodge package at Langa is seven (7) nights / six (6) days of fishing. NON-ANGLING ACTIVITIES: The lodge is situated in rural part of Iceland, and overall, this is a fishing-focused operation. However, with that said, there are a handful of non-angling activities including birdwatching, enjoying the wonderful landscapes, and trekking in the remote landscape. INTERNET/COMMUNICATION: The lodge offers guests unlimited Wi-Fi internet access. The comfortable lodge sits looking over the middle reaches of the river, it is a modern building offering single rooms as standard and all the modern comforts one needs. 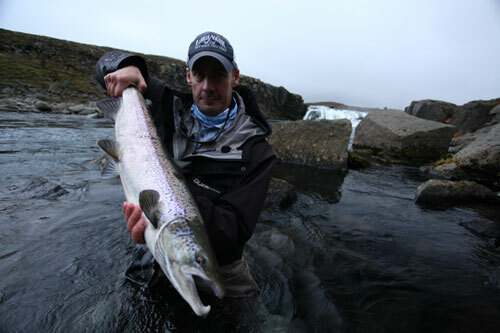 GENERAL INFO: A small and exclusive salmon river located on the Snaefellsnes peninsula in the west of Iceland. It is a short river fed by two mountain lakes and several smaller springs which combine to create 12 km of prime salmon holding water, as well as char and sea trout in the lower reaches. There are 27 named pools producing an annual average catch of 400+ salmon to just four rods. All of the pools are easily accessible with four wheel drive vehicles being able to get within 5 minutes' walk of each fishing spot. The salmon average 5-6 lbs but each season good numbers of fish over 12 lbs are landed. Most of the fishing is done with light weight set ups and floating lines throughout the season. EQUIPMENT REQUIRED: We recommend single handed rods, 9 - 10 foot in length in the 6-8 weight class. We recommend using floating lines and small flies as well as hitch tubes. We also recommend that anglers come prepared with sink tip lines and heavier flies should conditions call for it. Upon booking we will supply a detailed gear list for the river. Located one hours drive from the capital Reykavik, the Langa is extremely convenient for the international angler. Transfers to and from the lodge from the capital can be organised easily. ARRIVAL & DEPARTURE DETAILS: When possible, we suggest that you arrive the night before the start of your week at the Lodge, which means that you would fly into Reykjavik a day or two before your week's fishing and stay in a local hotel. There are a number of comfortable hotel options in Reykjavik, some good restaurants, and plenty to see and do. Gin-Clear's services are completely free! When you book a trip with us, you never pay more than when you book directly with the lodge or outfitter. Prime time: mid-July to early August. WHAT'S INCLUDED: All accommodations and meals at the lodge, Fully guided fishing two anglers per guide, use of wireless internet at the lodge. WHAT'S NOT INCLUDED: International airfare to Reykjavik, Hotel and meals in transit, Personal equipment, all fishing gear, flies and tackle, Gratuities for guides and lodge staff.